A message circulating online is wrongly suggesting that the Government has quietly shifted the "retirement payout age" from 65 to 70, the Central Provident Fund (CPF) Board said yesterday. The payout eligibility age for the Retirement Sum Scheme is 65 for those born from 1954 onwards, and this has not changed since it was announced in 2007, it added. 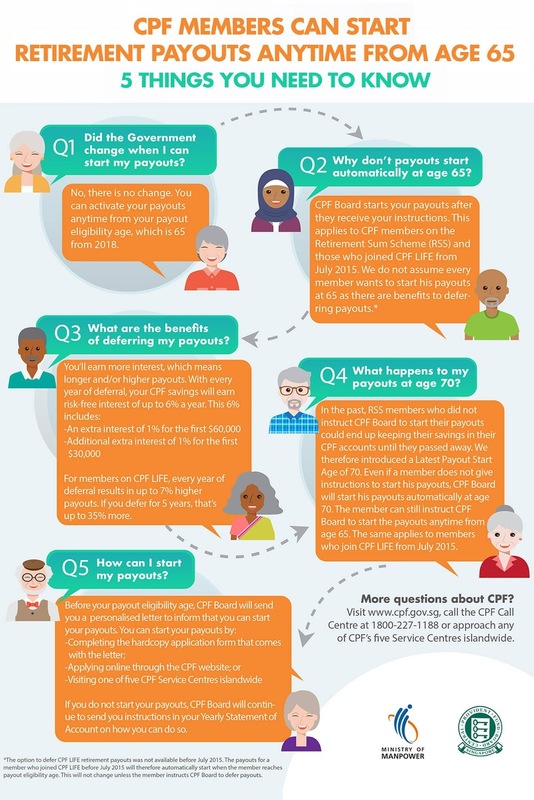 The CPF Board was responding to a message that recently went viral on social media, claiming the Government had surreptitiously raised the payout age from 65 to 70. The confusion was in relation to a letter CPF sends to its members who are approaching their eligible payout age. A sentence in the letter said "no action is required if you wish to start your payouts at age 70", which gave some people the impression that the payout age was moved to 70. Responding to media queries, a CPF Board spokesman said the letter was sent to CPF members to inform them that they can start their monthly payouts by completing an application form with their bank account details or applying online. "They can apply to start their payouts any time between the ages of 65 and 70. 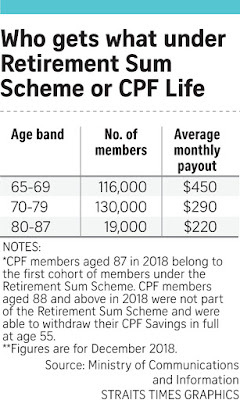 If they do not wish to start payouts before age 70, they need not do anything", and "members who defer the start of their payouts will benefit from getting more retirement savings with the attractive interest that they earn on their CPF savings", said the spokesman. If CPF members do not take any action, Retirement Sum Scheme payouts will automatically start at the age of 70. The spokesman said the CPF Act was amended in 2016 to allow for this automatic payout arrangement, which took effect in January last year. 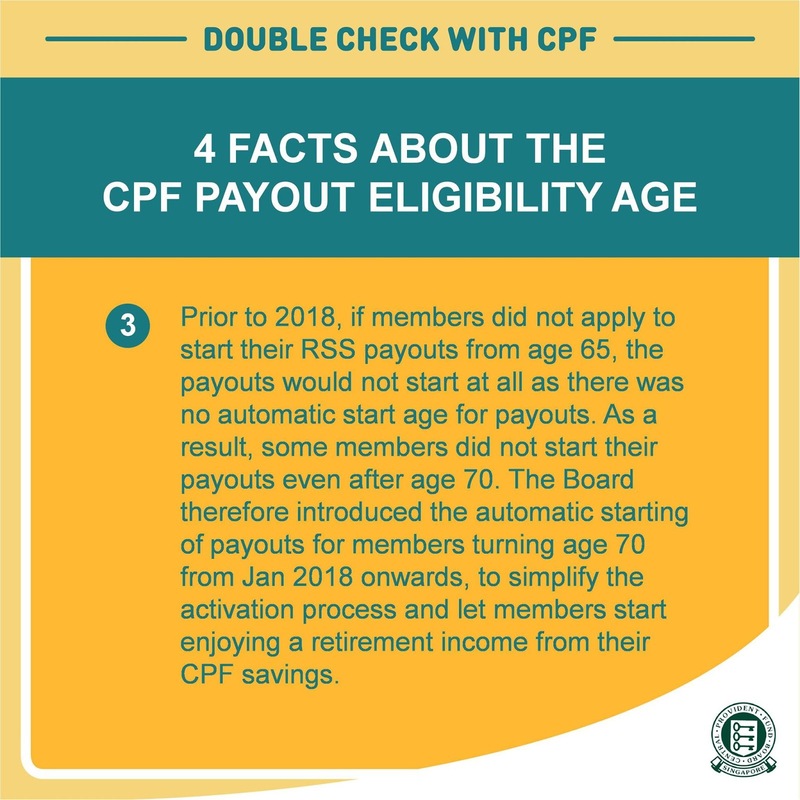 The CPF Board said that before this, some members did not start their monthly payouts even after age 70, as they did not apply to start their Retirement Sum Scheme payments. The automatic starting of payouts at age 70 "helps to simplify the activation process for members so they can start to enjoy a retirement income from their CPF savings", said the spokesman. Retiree Johnny Wong, 66, said the way the Retirement Sum Scheme is administered could be made simpler. Payouts should be automatic when an individual turns 65, and he can have the choice to opt out if he does not want the payout yet, he added. "There may be some who are illiterate or who may not understand how the current scheme works," Mr Wong said. Yesterday, the CPF Board also took to Facebook to clear the air, explaining why the message circulating online was "untrue". It also encouraged users to share its Facebook post. The people should not be blamed for starting the rumour about Central Provident Fund (CPF) payout being delayed till the age of 70 (CPF Board refutes claims that payout age raised; Jan 20). And it is true that if a person does not do anything, then the payout will indeed start at the age of 70. If the payout is supposed to be at the age of 65, then that should be the default age, and anyone who wants a later payout should have to indicate to the CPF Board that they want it at a later age. It is the CPF Board's actions that have caused the people to once again say that the Government is trying to hold back the money of Singaporeans. 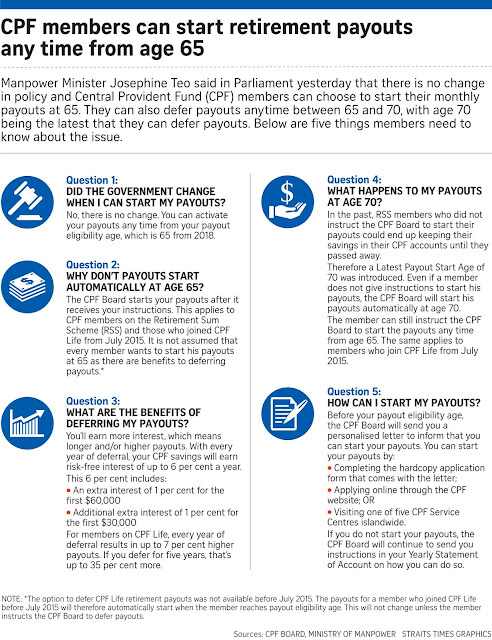 Manpower Minister Josephine Teo explained yesterday in Parliament why she is wary of making a sudden change in the policy on the age that Central Provident Fund (CPF) members can automatically receive monthly payouts from their retirement account. This is partly because members have been told for years that they can activate the payouts any time from 65 and payouts start when they instruct the CPF. "So, this has been the longstanding instruction," she said. "Every time there is a change, it takes a long while for people to get used to it." She suggested focusing on improving communication for the policy as it stands instead. "If we keep to this consistent line, there is less risk of further confusing," she added in her reply to Mr Lim Biow Chuan (Mountbatten) and Mr Png Eng Huat (Hougang). Mr Lim had expressed concern that the number of members who did not activate their payouts by 70 is not small, and asked if the payouts could start automatically at 65. Mrs Teo replied that she had given serious thought to it but said, among other things, that the CPF Board cannot do this and deprive members of the benefits of keeping their money in the CPF. She conceded that the CPF Board could do a better job of keeping members up to speed on policy issues. "There is much room for improvement in the way (the board) communicates key issues like starting payouts." She was referring to the recent confusion among some CPF members over the age at which they can start receiving monthly payouts. 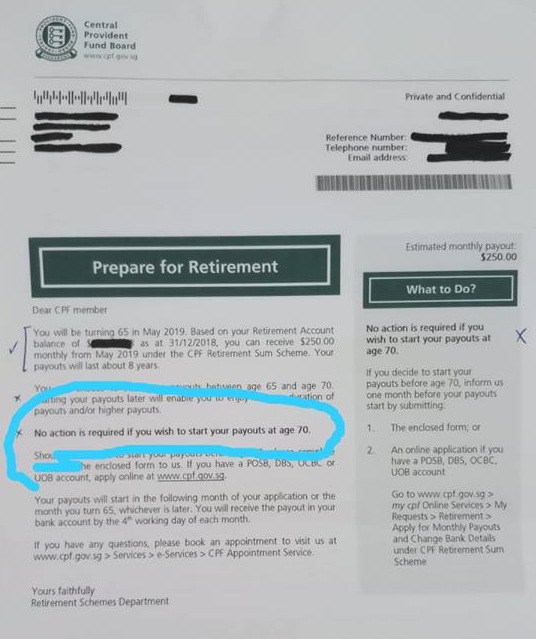 Social media posts of a CPF letter that advised the recipient about his payout options on turning 65 led some people to mistakenly conclude the payout age had been raised to 70. Others thought that if they did not apply to start receiving payouts at age 65, the next time they could do so would be at 70 years old. It led to at least nine MPs asking for, among other things, to allow members to automatically receive their payouts at age 65. 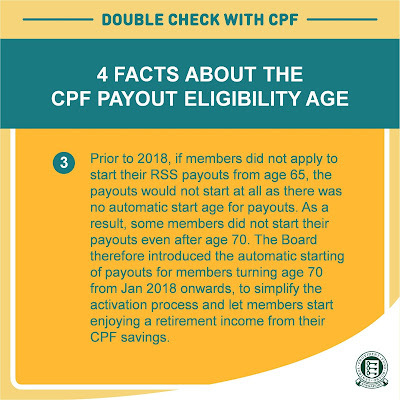 Mrs Teo, in her reply, stressed that there will be no change in the policy: CPF members can continue to choose to start monthly payouts at 65, or defer them to any time between 65 and 70. She assured the House that the CPF Board will take steps to improve communication, including reviewing letters sent to those nearing their payout eligibility age, to prevent the kind of misunderstanding that sparked the recent confusion. She also said that from this year, all members reaching their eligibility payout age can attend a CPF Retirement Planning Service, a face-to-face personal service. In her reply to Mr Liang Eng Hwa (Holland-Bukit Timah GRC), she encouraged members to visit CPF service centres across the island to get customised guidance. Her ministry, which oversees the CPF Board, will also work with other agencies such as the Social Service Offices and Silver Generation Office. Mrs Teo said there was no advantage for the CPF Board or the Government to want members to defer payouts beyond 65. In fact, members enjoy "tangible benefits" when payouts start later, like higher interest. She noted that for each year payouts are deferred, a member's CPF savings will earn risk-free interest of up to 6 per cent, well above market rates. So, members tend to defer their payouts, especially if they have other savings to draw on that are earning low interest or if they are still working. Mrs Teo said that in the past, some Retirement Sum Scheme (RSS) members had their savings in their CPF accounts until they died, which "is unsatisfactory". That led to a new rule last year stipulating that payouts cannot be deferred past 70, for members turning 70 from 2018. The minister said that about 60 per cent of RSS members who reached their eligibility age in 2017 did not activate their payouts. Even when they reached 70, about half did not ask to start their payouts. Mrs Teo said some of them may be keeping their savings in the CPF because they have no need for the money or want to earn higher interest. Others, however, may not know that they can start their payouts earlier and so did not instruct the CPF Board. Nearly three-quarters of those getting monthly payouts from the Central Provident Fund (CPF) Life scheme or Retirement Sum Scheme receive less than $500 a month, said Manpower Minister Josephine Teo. But younger cohorts are expected to get higher payouts, given "increased labour force participation and improvements to the CPF system made in the past decade", she added. For example, about six in 10 active members who turned 55 in 2017 had, at least, the basic retirement sum of $83,000 in their Retirement Accounts. This sum will give them a monthly payout of between $700 and $750 for life, she said. Mrs Teo made the point on Monday in a written parliamentary reply to Nominated MP Walter Theseira, who wanted, among other things, a breakdown of average monthly payouts under both schemes. 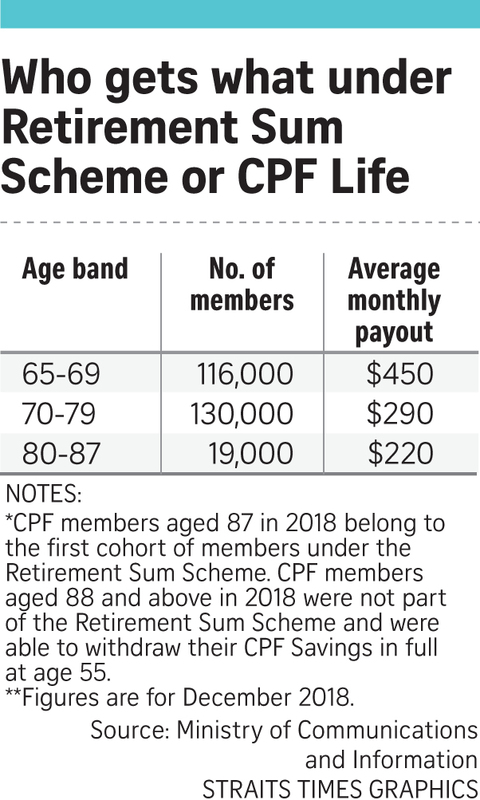 Last December, there were about 268,000 CPF members aged 65 and older who were getting retirement payouts from either of the two schemes, Mrs Teo said. She added that three-quarters were property owners, 54 per cent of whom owned four-room or larger Housing Board flats. Some 29 per cent owned three-room or smaller flats, while 17 per cent owned private properties. Mrs Teo also said the average monthly payout varies greatly among people from different age groups. The payout for those aged 65 to 69, for instance, is more than double that of those aged 80 to 87. In Parliament on Monday, Mrs Teo also fielded questions from several MPs who had asked if the CPF Board could allow automatic payouts when a member turns 65. They raised these questions after a photo of a CPF Board letter advising the recipient about his payout options on turning 65 went viral on social media last month. The photo led some people to mistakenly conclude that the payout age had been raised to 70, while others thought that if they did not apply to start receiving payouts at age 65, the next time they could do so would be at 70 years old. Mrs Teo said there will be no change in the existing policy. 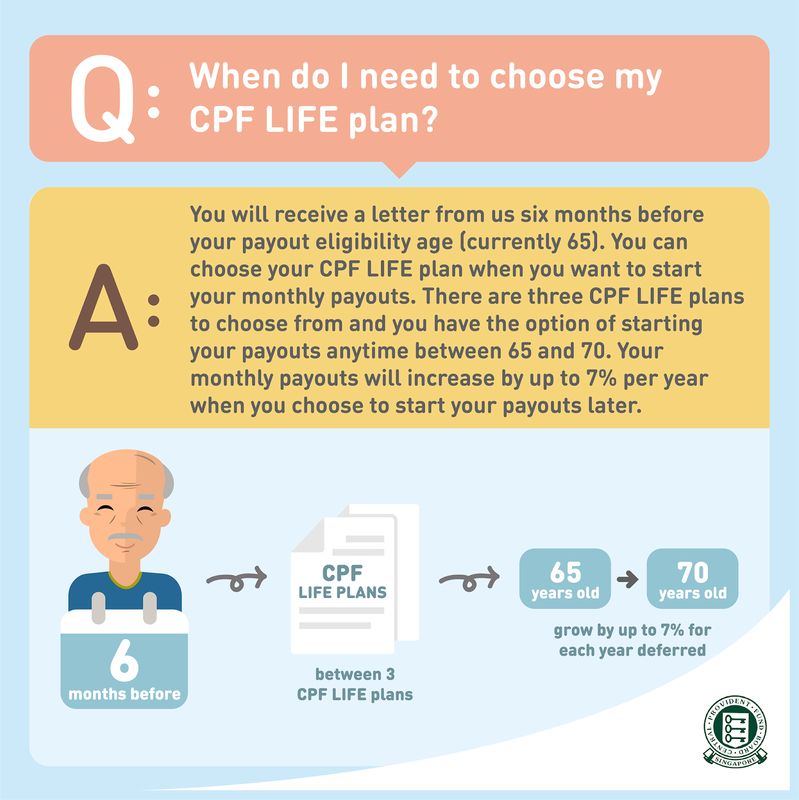 CPF members can continue to choose to start monthly payouts at 65, or defer them to any time between 65 and 70. She added that payouts will not automatically start at 65 as this would deprive members of the benefits of keeping their money in their CPF accounts.